The punchy-looking Caliber promised performance it didn't provide. As with the 300C, the looks were promising. 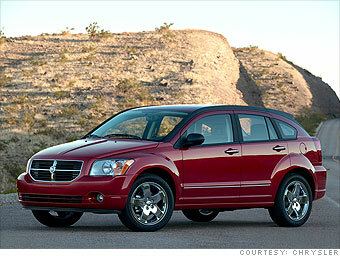 The Dodge Caliber compact car brought the chest-thumping attitude of the big Ram truck into a small package. The boxy hood and gape-mouthed grill, not to mention the name, spoke of explosive power. But this little car was more a popgun than a .357. Far from thrilling, acceleration was barely even adequate and the steering felt hollow and numb. Like the Magnum, the interior was cheap and looked like it could be disassembled with a butter knife. The Caliber did have a few clever features, the sort of novelties that Chrysler started putting into its cars to give them something besides "the look" to set them apart. In this case, there were stereo speakers that hung down from the open tailgate and an iPod holder that folded out from the center console. With flash and cleverness papering over a fundamentally weak product, the Caliber seems to have been a guide to a disastrous new product strategy at DaimlerChrysler's Michigan outpost.